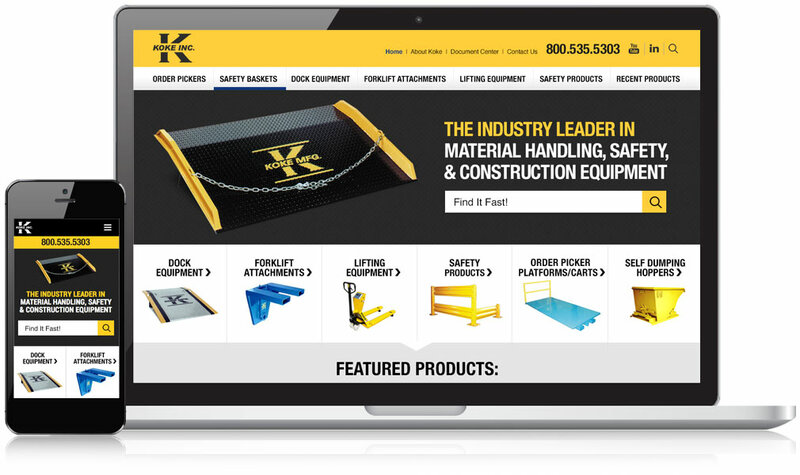 Website Design for Industrial Manufacturer, Koke Inc.
Home » Results » Web Design Portfolio » Koke Inc.
Koke Inc. is an industry-leading manufacturer of construction safety equipment. After years of working with Mannix Marketing on a SEO program to grow their rankings in the search engines and generate more leads online, it was time to give the website a fresh look and better user experience. This was especially important for the sake of their rankings, traffic, and conversions in light of Google’s new mobile-friendly ranking criteria. 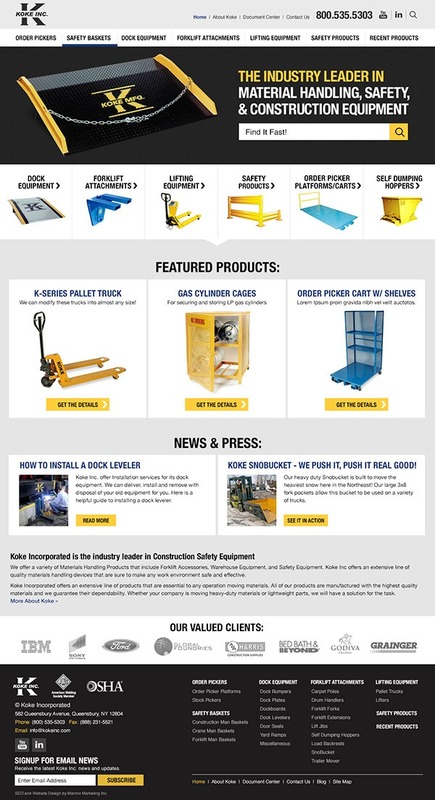 The goals for this project included making the site mobile-friendly, creating a modern and visually engaging design, and ultimately making it easier for prospective customers to find the right equipment for their needs. 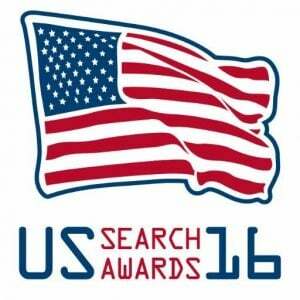 Want to learn more about the award-winning results, read the Koke SEO Case Study. Custom Website for Koke Inc.
A streamlined navigation menu and strategically placed calls-to-action simplify the process of finding products on the new website. In addition, we used large, high-quality product photos throughout the site to capture visitors’ attention and let them click-through to product landing pages where they’ll find more detailed product information. Trusted by a variety of well-known brands- including Global Foundries, Godiva, IBM, and others- Koke’s prestigious customer base is a testament to the quality of their products. It was important to leverage this factor on the new website as a way of building trust with new customers and first-time visitors, so we incorporated the logos of Koke’s prominent clients into the new design. Another crucial piece of this project was helping Koke retain the SEO value from their existing website and carry it over to the new version. This was a critical step in setting up the new website because our SEO team had been growing Koke’s placements in the search engines for a variety of competitive industry keyword phrases and didn’t want to see those results disappear. By applying SEO-friendly website development techniques throughout the redesign process, Koke’s search engine rankings have remained fully in-tact and traffic from prospective customers continued to increase with the new website. We are extremely pleased with all the efforts from the Mannix Marketing team. The redesign and update of the website was well worth it!